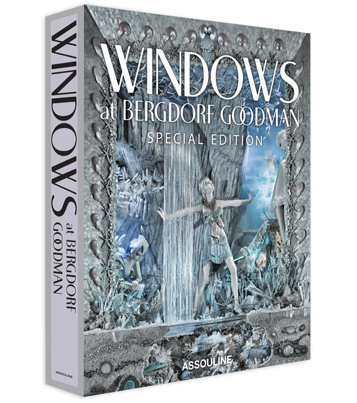 Assouline has just announced its latest title, Windows at Bergdorf Goodman: Special Edition, which features never before seen images of the iconic Bergdorf Goodman windows. So much luxury in just one book. Presented in a luxury slipcase format, this edition of one of Assouline's most celebrated titles is a collectors' item for lovers of art, fashion, whimsical fantasy, and more. Really, it’s the perfect book for your coffee table to dazzle your guests. The Bergdorf Goodman department store is famous for display windows that are overflowing with unusual objects, arresting images, and ambiguous, psychologically charged situations. Linda Fargo and David Hoey, along with a team of collaborators, have regularly conjured a mind-boggling array of possibilities in these windows. Always presenting provocative ideas, memorable images, and intriguing objects, Bergdorf’s windows are a true delight to view on the streets of New York City. Who could forget the Dada-inspired upside-down display of summer 2006, or the extraordinary white paper sculpture dreamscape from holiday 2000? The surreal worlds conjured behind the glass are as varied and fully realized as a three-ring traveling circus, a Louis XIV confectionary, and an Edwardian portrait sitting—artistic visions created by the Visual Department of Bergdorf Goodman. Like the best advertising and the best art, the windows’ statements are nothing if not memorable. Says the store’s director of visual presentation, David Hoey, “We’re drawn to extremes here. Minimalism is great. Maximalism too. What we avoid is medium-ism.” This volume presents the best of the past decade of memorable tableaux—sidewalk shadow boxes, you could say—in a covetable collector’s edition. Bergdorf Goodman is one store in one city providing one singular luxury experience and this book captures that glamour singlehandedly.Windows at Bergdorf Goodman: Special Edition is available for purchase at ASSOULINE boutiques worldwide and throughwww.assouline.com.